I've always been interested in learning foreign languages because I believe it's the first step to better get in touch with different cultures in order to really take part to people's environment and enjoy their lifestyles. What's the best way to do that? No doubt, it's living and sharing everything, day by day with them. Anyway if for any reasons, it sounds or really is impossible for you to join those dreamed countries right now, I'm gonna share with you an online platform that's very cool. 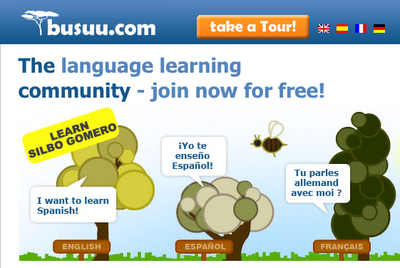 Busuu.com is an online social network service that provides learning units for twelve different languages. Each course is divided into learning units, for each unit, users benefit from several types of material, such as vocabulary and key phrases, dialogues, audio, podcasts and PDFs.Why is Busuu so cool? It's a modern and funny way of approaching to foreign languages, it gives you the basis on which you are gonna be able to easily build a firm mastery of the language. Through vocabulary, listening, writing and speaking exercises you'll be able to attain a learning route that will make it easier for you to keep on improving your communication skills. Just give it a try, it is free! P.S: for those wondering the meaning of the word Busuu, it used to be a language spoken in Cameroon, unfortunately nowadays it is almost extinct.